Mid-week. Hump day. 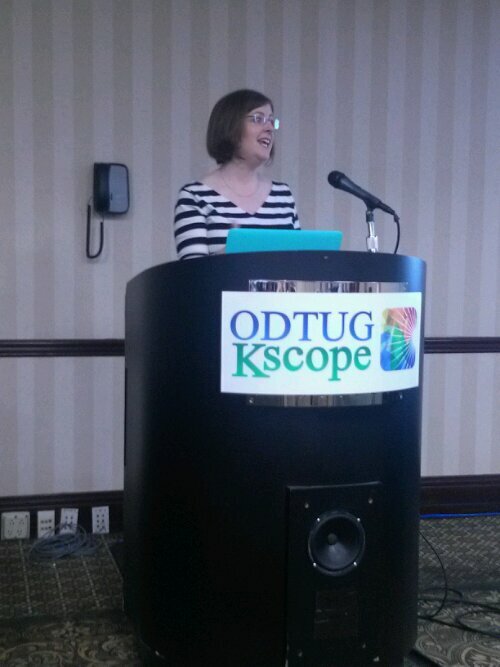 The day of the BIG event for KScope13. Morning Chi Gung as usual, but with 24 people showing up. Biggest group this week. We even have a few locals joining us now. Everyone seems to be enjoying these sessions. KScope attendees starting the day with Morning Chi Gung on the plaza in front of Harrahs casino. In fact, the Chi Gung class at KScope may be the original cross over session! Attendees are from across the spectrum from DBAs, to developers, to Hyperion/EPM folks to spouses of attendees. There is something for everyone in Morning Chi Gung. Everyone wants to be “agile” these days. 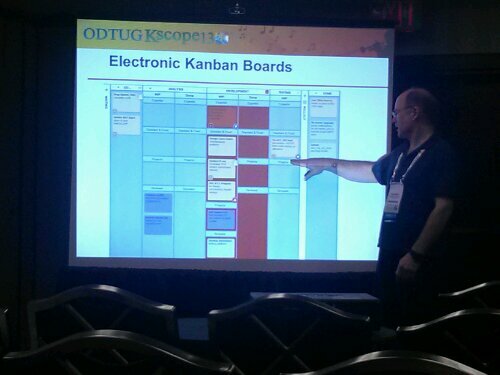 Stew Stryker of Dartmouth University came to KScope to share with us his experience in applying first Kanban then Scrum to the software development life cycle in his IT department. Stew Stryker, from Dartmouth College, discusses how his team has used Kanban, and now SCRUM, to improve their software development process. One of Stew’s insights was that to effectively implement a change in methodology like this and get adoption it is first necessary for the powers-that-be to recognize the current approach (usually water fall) is failing. If you do not know you have a problem, there is no motivation to fix it, right? 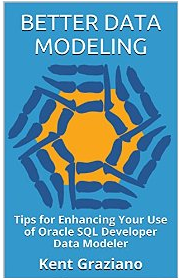 A key recommendation he had was to get a consultant that knows and has implemented Kanban for database projects to come in and work with you. Don’t try to do it by just reading articles and books or going to training. There are too many nuances and organizational dynamics to account for. 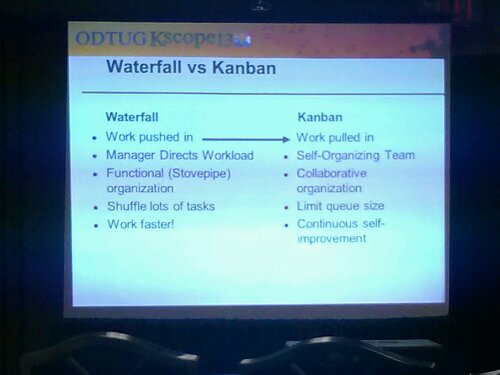 A simple comparison of aspects of a traditional waterfall methodology compared to the Kanban approach. Another key to succes was to prevent context switching – that is keep everyone focused on the task at hand for the duration of the interval (or sprint). He did a great little exercise with us that really showed how task switching costs a lot of time. In some case up to 10 times longer. It was great to hear real world experiences that we could all take back to our offices and implement and discuss. His team has experienced some great success but with lots of lessons learned, which he shared. They have now switch to SCRUM with even more success. I attended my second lab of the conference to learn from Maria Colgan (@SQLMaria) on how to prevent sub-optimal plans on SQL Statements. 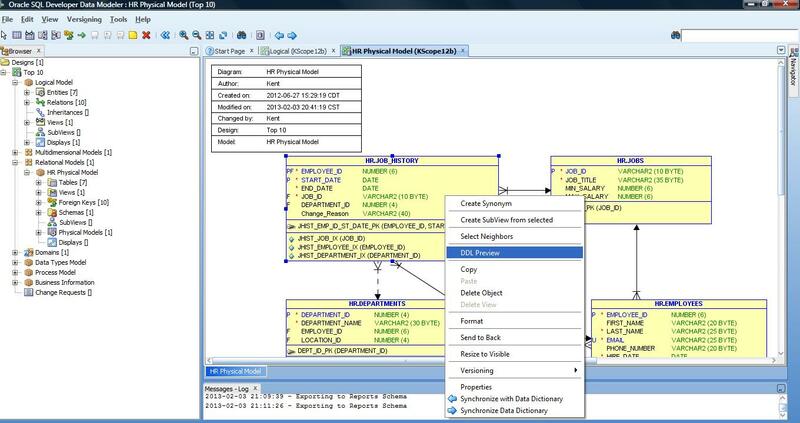 Oracle Senior Product Manager Maria Colgan walks us through how to analyze and tune some queries. It was a great session using the Oracle Demo Days virtual box image again (from OTN). Maria walked us through several queries with Explain Plans that did not seem quite right and showed us how to diagnose and fix the potential problems. It was a little tough for those of us who have not used Linux/Unix or command line in a few years but I did learn a lot and should be able to apply that knowledge when we have poor performing queries at my clients. Worse case, I can always start up the vm again and run through the lab. Another killer session from Maria showing us enhancements and new features to the query optimizer in the recently released Oracle 12c. 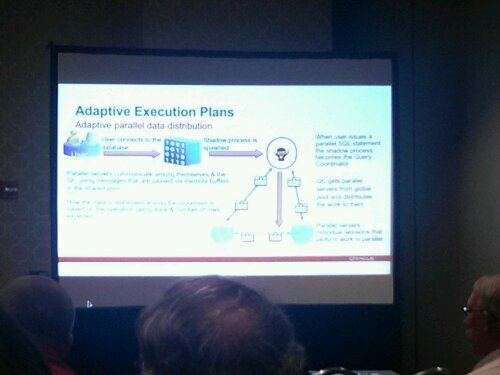 The key phrase for 12c “self-healing” and “adaptive”. Remember when there were just 17 rules for the optimizer that we could control with the syntax of the query? I guess this is better, but there are still rules to know to make the optimizer work well. And Maria definitely knows them! These days every tech event has to talk about big data. KScope13 is no different. 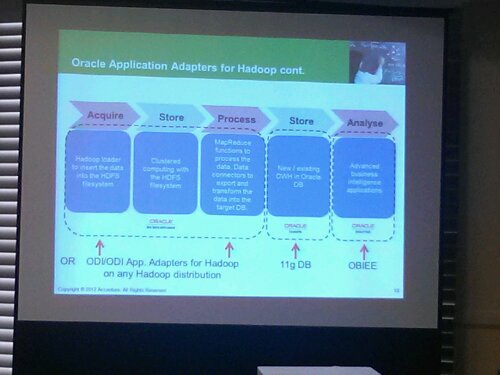 Alex Shlepakov, from Accenture’s Oracle BI practice, gave a nice talk about integrating Hadoop with OBIEE using ODI. 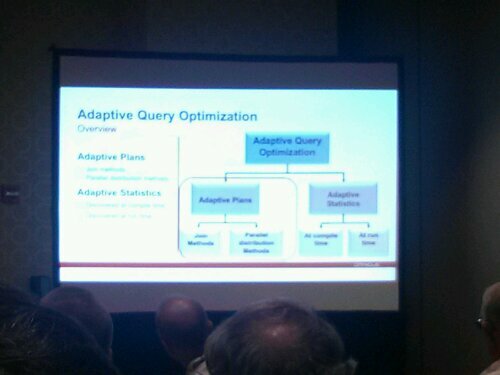 He did a really nice job explaining all the concepts and moving parts and how Oracle addressed these things. 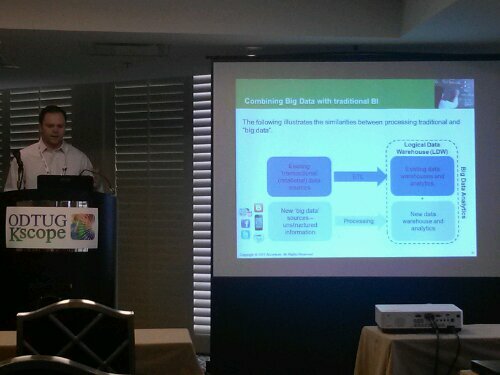 Alex presented about doing big data analysis using Oracle BI tools. Pretty sure these products cost lots of money too! But if you want to get value out of your big data, you may have to spend big money for the tools to help (unless you have a lot of programers with really big brains). My main take away from this session is that the tools to support Hadoop and big data analysis are evolving to make it easier for most programmers to get to the data without having to be Map Reduce programmers. But it will still be pretty hard, so you better have a good business case for digging into it. As in past years, ODTUG really did it up right. 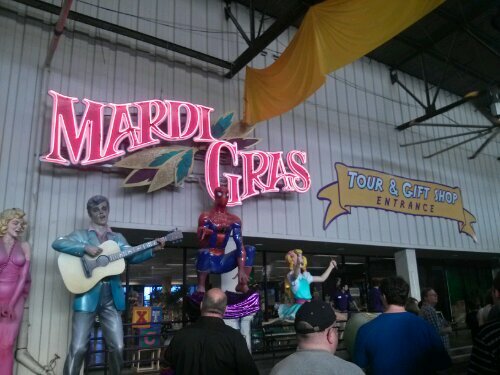 This was truly a special event to remember – we went to Mardi Gras World! The annual Special Event was held at Mardi Gras World where we got to see some of the big floats from the famous parade. 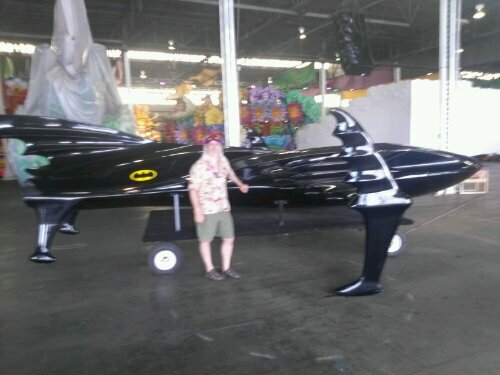 The Oracle Data Warrior finds Batman’s boat! The tour of the Mardi Gras warehouse included plenty of bead throwing from the floats by the board of directors and the various KScope vendors. This was followed by a nice evening of drinks and a buffet dinner with lots of great food (even some gluten free and vegetarian options). There was plenty of dancing to great cover band called The Mixed Nuts. 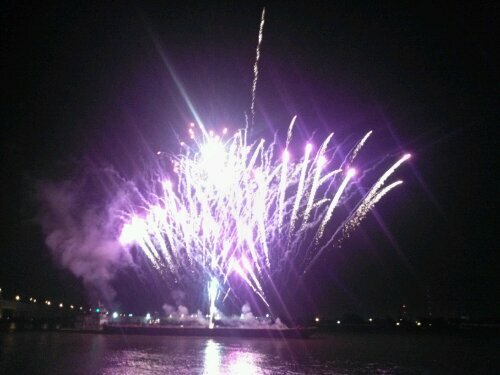 We finished the evening with a spectacular fire works display (which seems to becoming a standard at this event). Over too soon, it was last call, last dance, then back to the buses and a short ride to the hotel. And then there were the after parties…. Stay tuned for my notes on our final day in New Orleans.